Youve heard for some time now that Greenville SC is the place to live. Well now you can own a piece of it, as Ole Blue Eyes would say, "Right through the very heart of it! You heard correctly. Our 4th floor Book Ends Condo is one block off of Main Street with smashing 270-degree views of the city skyline and Caesar Head Mountain. 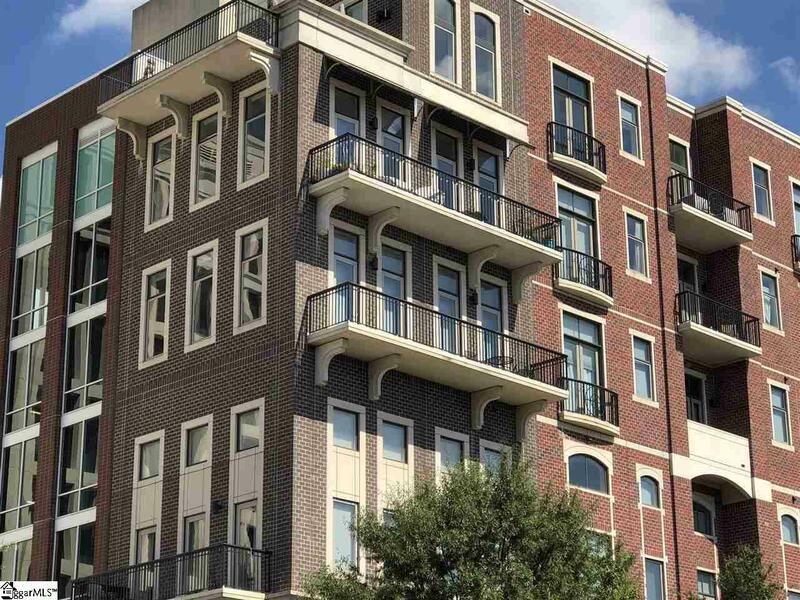 While lounging on your 27 ft balcony, enjoy the bustle of the community below which offers Saturday morning Farmers Markets, Live music during the annual festivals such as Fall for Greenville, or take in a front row seat to the 4th of July fireworks! With floor to ceiling windows on the north and west walls, bask in the beautiful sunsets and moon rises so well known to us Greenvillians. Sporting an open floor plan and 10-foot ceilings, we have a dramatic property from which you can be proud to entertain guests. Accented by granite counters, the kitchen area (with stainless fridge, stove/oven, microwave and dishwasher) is well suited for serving dinner and drinks. Continuous hardwood floors draw the living and dining areas in with the very spacious master bedroom suite. The en-suite master bathroom provides separate rooms for the shower (with marble surrounds), master sink and large walk-in closet. On balmy nights you may wish to retire while opening the double French doors leading to the Juliet balcony. Other amenities and services include secured access to the building from the street and adjacent city garage where you can obtain covered parking within feet of your condo door. Water, trash, exterior maintenance and pet limits are included in the regime. Part of the regime fee covers a geothermal heating system that keeps the electric bills around $70 per month. Seller will pay the parking deck fee for one year for one vehicle with an acceptable offer.